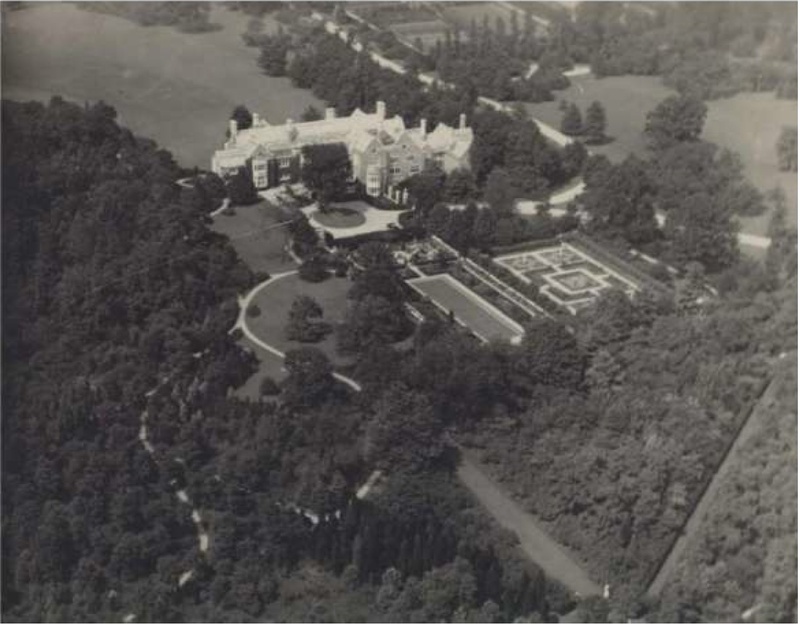 An aerial of 'Ormston', the John E. Aldred estate designed by Bertram G. Goodhue between 1913-1918 in Lattingtown with outbuildings by Henry W. Rowe and landscaping by the Olmsted Brothers. Click HERE to see a brochure from when 'Ormston' was for sale. Click HERE to see the estate on google earth and HERE on bing. Photo from the Aiglon Archives. It was a companion Aiglon Aerial view of Ormston, from another angle, that I discovered in a book on American architecture at the library, that started my interest in Long Island estates over fifty years ago. Great photo ! One of the best of its day. Should the order that owns this decide to sell up, we should all take up pitchforks and march to prevent its destruction---house, grounds, gardens all mostly intact and beautifully executed.